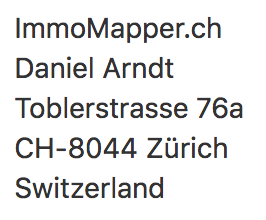 The following data protection declaration applies to the use of our online service ImmoMapper.ch and its subdomains (hereinafter referred to as “website”). We value data protection very highly. Your personal data is collected and processed in compliance with the applicable data protection regulations, in particular the General Data Protection Regulation (GDPR). If you wish to object to the collection, processing or use of your data by us in whole or in part in accordance with these data protection provisions, you may address your objection to the person responsible. You can save and print this data protection declaration at any time. We or our hosting provider process inventory data, contact data, content data, contract data, usage data, meta data and communication data of customers, interested parties and visitors to this website on the basis of our legitimate interests in the efficient and secure provision of our website in accordance with Art. 6 Section 1 S. 1 f) GDPR in connection with Art. 28 GDPR. We use this log data without allocation to your person or other profiling for statistical evaluations for the purpose of operating, security and optimisation of our website, but also for anonymous recording of the number of visitors to our website (traffic) and for the scope and type of use of our website and services, as well as for billing purposes to measure the number of clicks received from cooperation partners. This information enables us to provide personalized and location-based content and analyze traffic, troubleshoot and correct errors, and improve our services. This is also our legitimate interest pursuant to Art. 6 Section 1 S. 1 f) GDPR. We reserve the right to subsequently check the log data if there is a justified suspicion of illegal use on the basis of concrete indications. We store IP addresses in the log files for a limited period of time if this is necessary for security purposes or for the provision of services or the billing of a service. We also store IP addresses if we have the concrete suspicion of a criminal offence in connection with the use of our website. We also store the date of your last visit as part of your account (e.g., when registering, logging in, clicking links etc). We use so-called session cookies to optimize our website. A session cookie is a small text file that is sent by the server to your browser when you visit the website and stored temporarily on your hard drive. This file contains a so-called session ID, which can be used to assign various requests from your browser to the joint session. This enables your computer to be recognised when you return to our website. To a small extent, we also use persistent cookies (also small text files that are stored with your browser) that remain on your end device and enable us to recognize your browser the next time you visit. These cookies are stored on your hard drive and are deleted automatically after the specified time. This enables us to present our services to you in a more user-friendly, effective and secure manner and, for example, to display information on the site that is specifically tailored to your interests. You can set your browser so that you are informed in advance when cookies are set and can decide in individual cases whether you want to exclude the acceptance of cookies for certain cases or generally, or that cookies are completely prevented. This may limit the functionality of the website. We process personal data that we need to fulfil our contractual obligations, such as name, address, e-mail address, products ordered, invoice and payment data. The collection of this data is necessary for the conclusion of the contract. The data will be deleted after the warranty periods and statutory retention periods have expired. Data linked to a user account (see below) will in any case be retained for the duration of the account’s management. The legal basis for the processing of this data is Art. 6 Section 1 S. 1 b) GDPR, because this data is required so that we can fulfil our contractual obligations towards you. For the new registration we collect just email address and password. You can have us delete a user account once it has been created at any time, without incurring any costs other than the transmission costs according to the basic tariffs. A text message to the contact data mentioned under point 1 (e.g., email) is sufficient for this. We will then delete your stored personal data unless we need to store it for the processing of orders or due to legal storage obligations. The legal basis for processing this data is your consent pursuant to Art. 6 Section 1 S. 1 a) GDPR. Our newsletter provider Mailchimp stores the registration data as long as they are needed for the dispatch of the newsletter. The legal basis for sending the newsletter is your consent in accordance with Art. 6 Section 1 S. 1 a) in conjunction with Art. 7 GDPR in conjunction with § 7 Section 2 No. 3 UWG. Legal basis for the logging of the registration is our justified interest in the proof that the dispatch was made with your consent. You can cancel the registration at any time without incurring any costs other than the transmission costs according to the basic tariffs. A notification in text form to the contact data mentioned under point 1 (e.g., email) is sufficient for this. Of course, you will also find a unsubscribe link in every newsletter. If you contact us (e.g., via email), we will process your details to process the enquiry and in the event that follow-up questions arise. If the data processing is carried out to carry out pre-contractual measures, which take place at your request, or, if you are already our customer, to carry out the contract, the legal basis for this data processing is Art. 6 Sec. 1 S. 1 b) GDPR. We only process further personal data if you consent to this (Art. 6 Sec. 1 S. 1 a) GDPR) or if we have a legitimate interest in processing your data (Art. 6 Section 1 S. 1 f) GDPR). A legitimate interest lies, for example, in replying to your email. Google has submitted to the Privacy Shield Agreement concluded between the European Union and the USA and certified itself. As a result, Google undertakes to comply with the standards and regulations of European data protection law. Further information can be found in the following linked entry: https://www.privacyshield.gov/participant?id=a2zt000000001L5AAI&status=Active. We have enabled IP anonymization on this website (anonymizeIp). This will cause Google to previously shorten your IP address within member states of the European Union or other states party to the Agreement on the European Economic Area. Only in exceptional cases will the full IP address be transmitted to and truncated by Google on servers in the United States. Google will use this information on our behalf to evaluate your use of the website, to compile reports on website activity and to provide us with other services relating to website activity and internet usage. You can also prevent the transmission of data generated by the cookie and related to your use of the website (including your IP address) to Google and the processing of this data by Google by downloading and installing the browser plug-in available under the following link: http://tools.google.com/dlpage/gaoptout?hl=en. Under the applicable laws, you have various rights with respect to your personal information. If you wish to exercise these rights, please send your request by email or by post, clearly identifying yourself, to the address given in paragraph 1.
the existence of automated decision-making including profiling in accordance with Art. 22 Section 1 and 4 GDPR and – at least in these cases – meaningful information on the logic involved as well as the scope and intended effects of such processing for you. If personal data are transferred to a third country or to an international organisation, you have the right to be informed of the appropriate guarantees pursuant to Art. 46 GDPR in connection with the transfer. You revoke your consent on which the processing was based pursuant to Art. 6 Section 1 1 a) GDPR or Art. 9 Section 2 a) GDPR and there is no other legal basis for the processing. You object to the processing pursuant to Art. 21 Section 1 GDPR and there are no overriding legitimate reasons for the processing or you object to the processing pursuant to Art. 21 Section 2 GDPR. The personal data were collected in relation to information society services offered pursuant to Art. 8 Section 1 GDPR. If we have made the personal data public and we are obliged to delete them pursuant to Art. 17 Section 1 GDPR, we shall take appropriate measures, including technical measures, taking into account the available technology and the implementation costs, to inform those responsible for data processing who process the personal data that you have requested them to delete all links to this personal data or copies or replications of this personal data. you have lodged an objection against the processing pursuant to Art. 21 Section 1 GDPR, as long as it has not yet been established whether the legitimate reasons of our company outweigh yours. You also have the right to object to a lawful processing of your personal data by us if this is based on your particular situation and our interests in the processing do not outweigh. You have the right, for reasons arising from your particular situation, to object at any time to the processing of personal data concerning you on the basis of Art. 6 Section 1 S. 1 e) or f) GDPR; this also applies to profiling based on these provisions. We no longer process personal data unless we can prove compelling reasons for the processing worthy of protection which outweigh your interests, rights and freedoms, or the processing serves the assertion, exercise or defence of legal claims. You have the right to object to the processing of your personal data for scientific or historical research purposes or for statistical purposes pursuant to Art. 89 Section 1 GDPR for reasons arising from your particular situation, unless such processing is necessary for the performance of a task in the public interest. You have the right not to be subject to any decision based solely on automated processing – including profiling – which has any legal effect on you or which significantly affects you in a similar manner. Your personal data will be transmitted encrypted. This applies especially to the user login. We use the SSL (Secure Socket Layer) coding system, but point out that data transmission over the Internet (e.g. when communicating by email) can have security gaps. A complete protection of the data against access by third parties is not possible. To secure your data, we maintain technical and organisational security measures in accordance with Art. 32 GDPR, which we continually adapt to the state of the art. Furthermore, we do not guarantee that our services will be available at certain times; disruptions, interruptions or failures cannot be ruled out. The servers we use are regularly and carefully backed up. In the event that we outsource certain parts of the data processing, we contractually oblige data processors to use personal data only in accordance with the requirements of the data protection laws and to guarantee the protection of the rights of the person concerned.